The Committee for Adelaide is urging radical changes to stimulate the local economy. The group describes itself as a non-partisan think-tank and is self-funded by its members, who are something of a who’s-who of Adelaide. Ian Smith is one of the group’s founders; a corporate lobbyist with strong Liberal Party ties, but his motivation is more personal than political. “I’ve got two young kids, a nine-year-old and a six-year-old and … if you don’t plan now for a sort of an Adelaide in which they can work, it won’t happen,” he said. Somehow those retirement plans changed and he is pleased to be part of the committee because he can give an outsider’s viewpoint. “I’ve lived in a number of second-tier cities and we made a recent decision … to go somewhere rather than the company sending me somewhere and we chose to come here, so we thought about it very deeply, coming here and we love it,” he said of Adelaide. “The air’s clean, the food’s good, the wine’s not bad either,” he said. Josh Fanning also is on the committee and full of enthusiasm, calling himself the ‘token young guy’. “I think Adelaide’s on the cusp of something really amazing,” he said. “We’ve gone through such tremendous change in the last 18 months or at least that’s the feeling that I get with my peers, with business,” he said. “Being a small business owner, I’m seeing more and more small businesses opening up and giving it a go and I think that sort of momentum is incredible. Mary Patetsos was quick to put her hand up to be involved in the committee and has a background in social housing, health and aged care. She might be from the opposite end of the political spectrum from Ian Smith, but her motivations are similar. “I didn’t want to look back in five years’ time when my daughter hit her late teens, early 20s and didn’t have options in terms of employment,” she said. 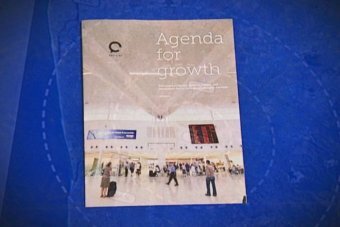 The committee has released its first report, Agenda for Growth, which outlines how development of South Australia’s human and economic capital has stalled. “Santos have been brilliant supporting and helping us,” he said.